LOS ANGELES, Calif. -- Two decades have passed since Matt Limegrover was last here, taking part in the Rose Bowl. At the time, he never thought he’d be back. In 1995, Limegrover was a twentysomething grad assistant working with the offensive live at Northwestern. It was the year that head coach Gary Barnett and the Wildcats caught lightning in a bottle. After winning just 31 games in the previous 15 seasons – combined – Northwestern went 8-0 in the Big Ten and 10-1 in the regular season, to earn a berth in the 1996 Rose Bowl. Prior to that season, the last time Northwestern had even been in a bowl was in 1948, which was also their only bowl appearance – ever. Until that 1995 season. Limegrover, the Pennsylvania native and assistant coach who rebuilt Penn State’s offensive line in his very first season in 2016, remembers it well. He thought that trip to Pasadena, to play USC, would be his first and last. Limegrover likens the surprise path that Penn State took to the Rose Bowl in 2016, a 2-2 start coming off a previous season that was less-than-stellar, to the route that the Wildcats took as well. In 1995, head coach Gary Barnett was entering his fourth season at Northwestern, having endured seasons of 3-8, 2-9 and 3-7-1, with only five conference wins to show for it. But Northwestern had shown steady improvement, although not all of it immediately evident. Ron Vanderlinden, a name familiar to Penn State fans, was the team’s defensive coordinator. Linebacker Pat Fitzgerald, an All-American and a two-time Big Ten Defensive Player of the Year (and now the Northwestern head coach), anchored the defense and running back Darnell Autrey, who finished fourth in the 1995 Heisman voting, was the focal point of the offense. Autrey was featured on the cover of Sports Illustrated after Northwestern defeated No. 6 Penn State, 21-10, late in that 1995 season. As a GA at Northwestern, Limegrover worked under Tom Bratton, a veteran O-line coach who coached with Penn State head coach James Franklin and strength coach Dwight Galt at Maryland. Nittany Lion safeties coach Tim Banks coached with Bratton at Illinois, while PSU running backs coach Charles Huff -- like Limegrover -- served as an offensive line assistant to Bratton, also at Maryland. Northwestern entered the 1996 Rose Bowl ranked No. 3, but fell to a USC squad that was 8-2-1 entering the game. USC’s Brad Otton threw for 391 yards, completing 12 of his passes for 216 yards and a TD to Keyshawn Johnson. Northwestern was minus Fitzgerald, out with a broken leg. The loss still stings a bit, which was part of the message Limegrover received from his former players and colleagues. “A high number of the guys who reached out from the ’96 Rose Bowl team remember it as such a special year,” he said. “But the one regret they had was not being able to win the Rose Bowl and put a cap on it. We came out of nowhere and won the Big Ten, with the coach of the year in Gary and the player of the year in Pat and with Darnell Autrey, the running back, who were fantastic. Limegrover has delivered that message to his own players. For Limegrover, it’s been quite the journey. After Northwestern, he had coaching stops at Emporia State, Southern Illinois, Northern Illinois and Minnesota. 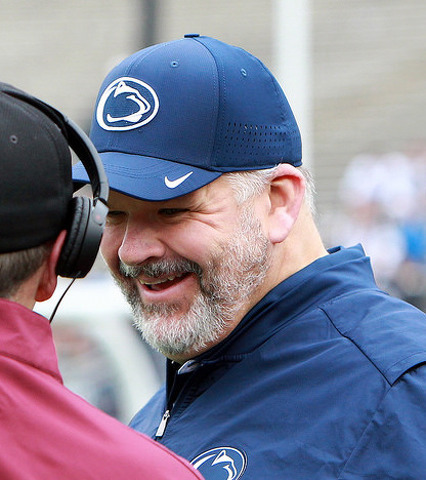 Before coming to Penn State in January, Limegrover coached for five seasons at Minnesota, but he didn’t come close to making it to Pasadena via the Twin Cities. And even though he’s here – again – it’s still not all wine and roses. After the Penn State coaches and brass went to a dinner at the Rose Bowl stadium Thursday night, they returned to the team hotel and worked until 11:45 p.m. They then rose early and had a Franklin-led staff meeting at 6:30 a.m., in advance of the Penn State’s media day, which began at 8 a.m.
“The first time here taught me to enjoy every minute, the ups and downs,” Limegrover said, “how hectic it is, trying to get things done. We’re out of our comfort zone, we’re not in our own office, we’re not in our own complex. But things have to get done in order for us to have success in the game. 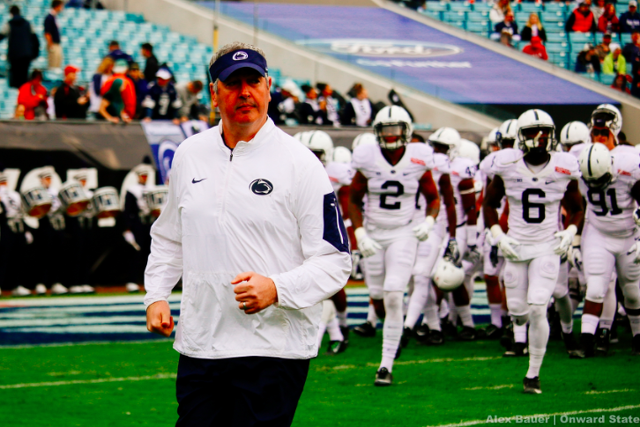 Don't worry Penn State fans, Joe Moorhead isn't going anywhere just yet. Speaking to the media in the days leading up to the Rose Bowl on Jan. 2, one of the hottest offensive coordinators in the nation answered questions about his future at Penn State and the reported interest in his services following a Big Ten championship victory earlier this month.